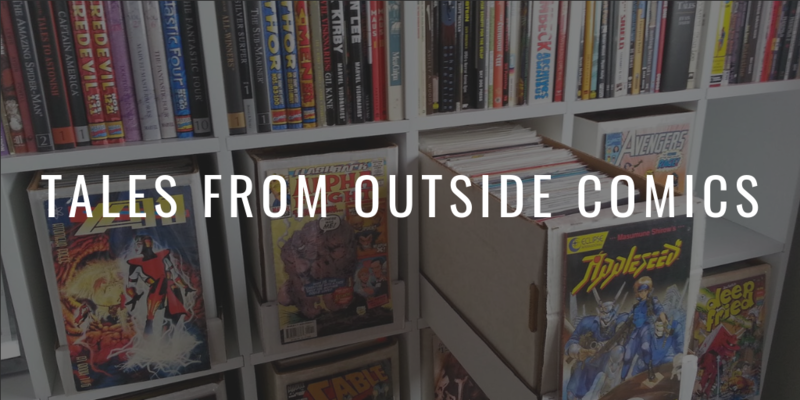 Hello, Happy Holidays, and welcome to another Tales from Outside Comics! The series of posts from someone just like you, a conduit for the psychic cuttlefish collective trying to escape from aquariums everywhere. They’ve seen what people do to the lobsters, and they don’t want to be next. Today, I’ll be following up on last time, continuing the story of the chances I’ve gotten to pitch ideas to comics companies. When I left off last time, I had just gotten the email address of an editor at an indie comics company, one that was looking to put together an anthology. Basically, the perfect chance to get a foot in the door of the industry. I’d been studying how people got started in comics for a while now, and knew that this was typically it – virtually nobody starts out writing a 10 year epic with their first series. Despite most of us probably wanting to create some kind of series like that, you need to start small. And for me, this was it; my first shot at a first shot. I don’t want to burry the lead too far down, so I may as well cop to it now: I blew it. Sure, I made plenty of the mistakes that lots of first-timers do; overcommitting and then subsequently blowing a self-imposed deadline, trying to stretch a story into multiple parts that could probably work better in just one, and being too open about my personal life in a new, professional relationship. I’m avoiding the details, because, quite frankly, it’s still embarrassing to think about. But it wasn’t any of that newbie, unprofessional behavior that screwed things up, and that’s what hurts the most in hindsight. The last email I got from the editor was along the lines of “hey, I’m really busy right now, circle back on this later.” Which, if I got a message like that now, I’d know would mean “follow-up with me in a month or so.” (I learned since then, via one of the advice links here on Creator Resource, that standard follow-up time is a month unless stated otherwise.) But instead, I let a friend of mine convince me that the message was a polite way of blowing me off. So I never circled back. I never followed up. Instead, I just gave up, and before I knew it, I hadn’t written anything in nearly 4 years. I could probably get into why I let myself give up so easily – I was going through a pretty hard time, and had a bad combination of low self-esteem while also being highly self-critical. (Callback, once again, to why therapy can be so important for creatives – that’s something that doesn’t go away on its own; you have to work at it. Hard.) But I’ll spare you any more details. Even worse, I don’t really have a solid trick to not giving up on yourself other than… just don’t. I put off writing this second part for a whole week. (I even took an hour between the words “whole” and “week” to procrastinate by watching part of a basketball game. And I don’t even like sports.) But I came back to it. Forced myself to sit down, and put that story, even a highly shortened version of it, into words. It’s really the only way to fight through wanting to give up – don’t let yourself. And it’s really easy, this time of year, to make excuses to make giving up easier. “I’m too busy gift shopping to write,” or “when it’s nasty weather outside, I don’t feel like doing anything,” or even “I’m just so used to taking time off in December, I may as well not write, either.” And if you find yourself giving in to these temporary traps of resistance, don’t beat yourself up for doing so. That’s just another way to avoid the issue. Sit down and write. I don’t have a time machine to go back and make myself follow up on that one chance with that one editor. All I can do, going forward, is not let myself make that mistake again. Which brings us to the third part of my pitching experience. I recently put together a pitch document for a different indie comics publisher. It’s been two months, and I still haven’t heard back from them. (Which, I guess is never a guarantee when you’re “cold pitching.” Submitting ideas to a publisher that’s never heard of you.) After Christmas, I’m going to push forward the email one more time. Saying something cheerful, asking if they’ve looked over my miniseries submission yet. Sure, I recognize that it might be an exercise in futility, but I’m holding myself to it, anyway. Silence is only a rejection if you let it be. And at least that’s something.